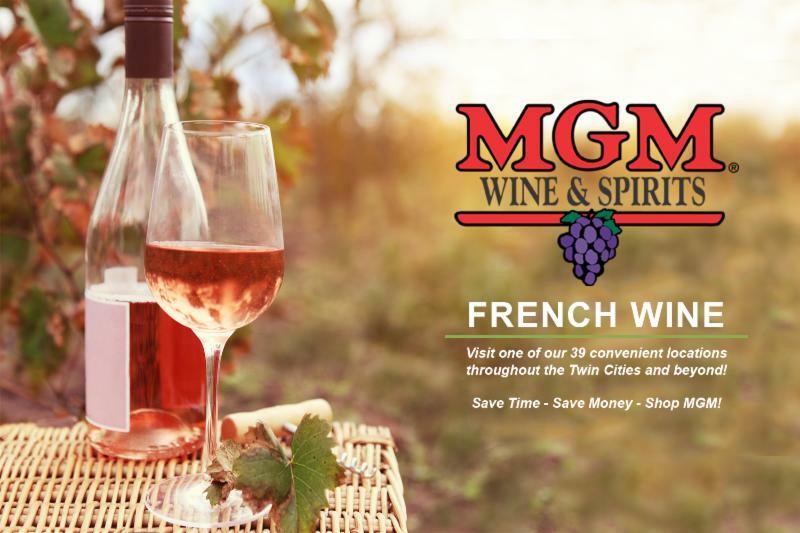 There is a great deal of delicious French wine-you just need to know where to look since the name of the grape is not usually seen on the bottle. The French are firm believers in terroir, the idea that the land really makes the wine and that every village and district has its own distinctive climate and soil, and the grape is an expression of the land. So their wine labels are all about location. Look for certain locations of origin and you’ll be on your way to finding some favorites. Bastille Day, also called French National Day, is held each year on this date to commemorate the beginning of the French Revolution with the Storming of the Bastille on July 14, 1789, and the unity of the French people at the FÃªte de la FÃ©dÃ©ration on July 14, 1790. Ã€ votre santÃ© ! Savvy sippers in Europe have long known the power of pink-and it’s not the sweet stuff you may think of. The coastal Provence region is the heart of the world’s dry rosÃ© production. Here, the roseÌ is mostly made from Grenache and Cinsault, though the local grape Tibouren can also produce some roseÌs with good character. Even within a single wine-producing region such as Provence, rosÃ©s will display a range of colors and flavors, but overall Provence rosÃ©s tend to be fresh, crisp, bright and dry. Bordeaux reds are considered by many wine connoisseurs to be the world’s greatest, and are usually Cabernet Sauvignon- and Merlot-based blends. The white wine grape varietals are SeÌmillon, Sauvignon Blanc and Muscadelle, which produce dry wines that are aromatic and fruity and sweet wines that are rich, full flavored, round and concentrated. The hallmark of Bordeaux dry whites is a balanced flavor with a hint of oak. Some of the finest dry whites come from the Graves region, which stretches south from the historic city of Bordeaux on the left bank of the Gironde River. Entre-Deux-Mers-which means “between two seas”-also produces some crisp, dry whites. The famous dessert wine Sauternes hails from Bordeaux. As the RhoÌ‚ne River carved a path through France, it left a beautiful valley whose steep hillsides provide the perfect perch for vineyards. As the country’s second-largest wine region in terms of size and production, the RhoÌ‚ne Valley makes many luscious red wines. The region can be separated into two geographic areas, the north and south. The main difference between the red wines is that those from the northern RhÃ´ne are made with Syrah, while Grenache is dominant in the wines of the south, though up to 13 grape varieties are often blended in, including Syrah. 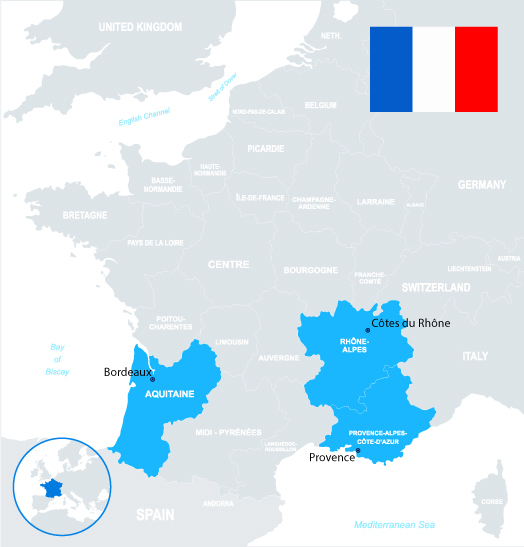 CoÌ‚tes du RhoÌ‚ne produces about 80 percent of the region’s wines, with the lion’s share made in the south. The reds blend mostly the same grapes as the famous ChaÌ‚teauneuf-du-Pape-a blend of up to 13 grape varieties including Grenache, Cinsaut, MourveÌ€dre, Syrah, Carignan and Gamay as well as white grapes such as Rousanne, Grenache Blanc, Clairette, Bourboulenc and Picardan may also be added-and offer a more cost-effective alternative. RosÃ© wines are probably the most versatile food wine around. They make great partners with salads, especially those that feature meat, seafood or citrus fruit. And it’s the wine of choice in the south of France to pair with the classic nicÌ§oise salad of fresh flaked tuna, hard-boiled egg, green beans, and black olives topped with anchovies and drizzled with olive oil dressing. Pink fish, such as salmon and steelhead trout, and meatier varieties including tuna, red snapper, swordfish and marlin find a friend in roseÌ. It also pairs great with garlicky grilled shrimp. Since Bordeaux comes in so many styles, you can easily find a wine to pair with food. Try light or medium-bodied whites or medium-bodied reds with seafood, fish and fowl. With famous full-bodied reds, cheeses such as Camembert, Brie and Roquefort, and meats such as beef, veal and lamb pair well. The lemony richness, minerality, and acidity of a dry white Bordeaux is a tasty match with seafood and shellfish, including oysters, grilled or fried fish, and fish cakes. These wines also pair quite nicely with chicken and Japanese food such as sushi and sashimi. 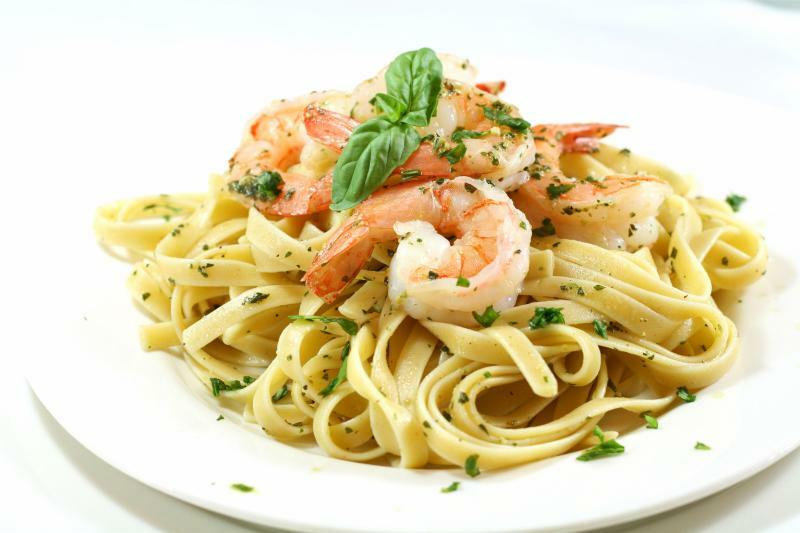 Fans of Italian cuisine can enjoy them with a creamy seafood pasta dish. Try Mouton Cadet Bordeaux Blanc with grilled fish, sole meuniÃ¨re or salmon with fresh pasta. The Augey Bordeaux Rouge pairs well with lamb, rich meat dishes, steak and Camembert, Roquefort or cheddar cheeses. 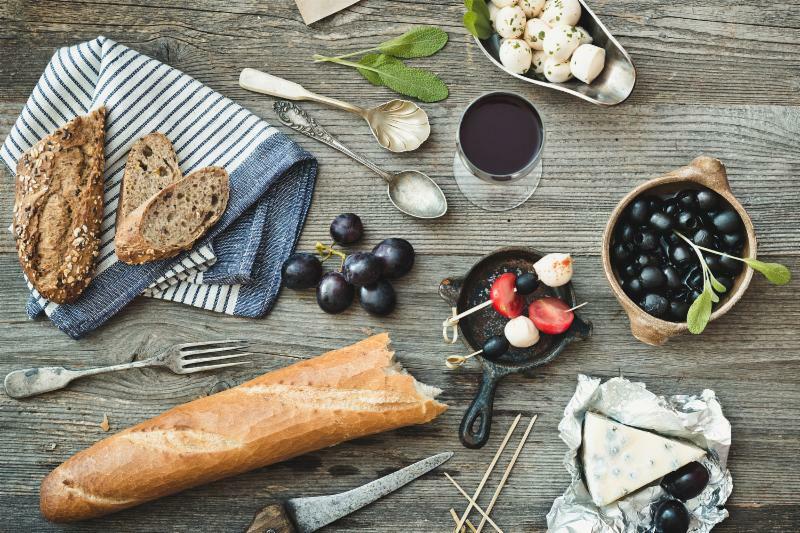 CÃ´tes du RhÃ´ne’s black fruit and spices pair well with roasted pork and poultry, as well as grilled lamb, Middle Eastern cuisine and aged cheddar cheese. Try Parallel 45 CÃ´tes du RhÃ´ne throughout the meal with grilled/roasted meats, Pot-au-feu, cheese and more. After grilling on a gas grill, the shrimp have a great flavor like they were grilled on charcoal. This recipe is also great with scallops (use two skewers so scallops will not roll). The grilled shrimp and scallops are good by themselves, in pasta, in salads or fajitas. Chop garlic on a cutting board. Sprinkle kosher salt over garlic and with the back of a large knife, smash the garlic on the cutting board to form a paste.